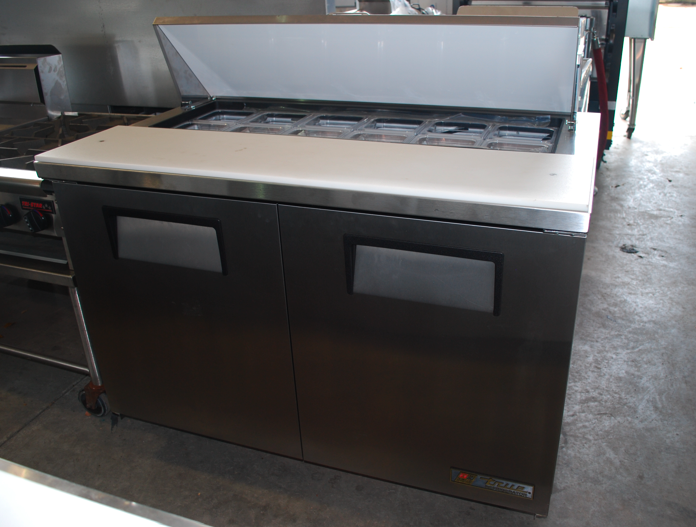 One Fat Frog Restaurant Equipment carries a variety of sandwich prep tables – different sizes and brands are continuously moving in and out of the One Fat Frog Restaurant Equipment Warehouse of Orlando. Some of these sandwich prep tables are known as “mega tops.” This means that they have 50 percent greater pan capacity than a standard sandwich prep table. Here’s some more information on sandwich prep tables. One Fat Frog Restaurant Equipment can get you financed for all of the used commercial restaurant equipment you need – including sandwich prep tables. One Fat Frog Restaurant Equipment also offers quick cash discounts and package deals on the entire stock of used commercial restaurant equipment. Come by One Fat Frog Restaurant Equipment today!